I grew up in the 70s in Scotland attending a 'non-denominational' primary school in a suburb of Glasgow. For non-denominational in Glasgow in the 70s, read Protestant (with maybe one Jewish kid per class). Catholics went to Catholic schools, Muslims and Hindus hadn't got as far as the suburbs so non-denominational meant Church of Scotland religious. Every day started with us all having to stand, bow our heads, clasp our hands and recite the school prayer. I can't tell you now the words of it, even though I was made to recite it every school day for six years. I know it had been written for the school because we definitely mentioned the school by name in it, but for the most part my early school days were marked by me standing with my eyes tightly shut, squirming and out of place, wanting to run away or scream because I felt like I had landed on an alien planet. Every assembly was conducted by the local CofS minister, a sickly sweet, condescending man who oozed insincerity (to me anyway), most people seemed to love him. There again most people knew him from the weekends, and I didn't. We were often read bible stories by the scary head mistress too. These made me feel less ill at ease because the stories themselves were interesting enough, but still, I always feared that the scary Mrs Scott would find me out. What would she find out? That I was the freak in the class, the one child who was being raised, unchristened and in an atheist household. By about p5, the first Muslim and Hindu children has touched down and I often wondered if they felt like me - they had the same dirty secret, that they couldn't relate to all the Protestant prayer and worship, but I couldn't ask, without giving away my own secret. As I reached upper primary, a quiet goody two shoes in general, I was really at odds with the religious parts of the curriculum. I remember wondering when I would be shouted at for not bowing for the morning prayer. Resolute, I stood there, straight-backed and with my eyes open, and the teacher stared me out. She could not let on she had seen me, without letting on that she too was unbowed and open-eyed. I remained silent during the Lord's prayer, I refused to let my brain parrot it as it was not who I was. Things have come along a lot in Scotland since my childhood. Classes are mixed now - in my own kids' classes there are Muslims, Hindus, Sikhs, Jews and even the odd Catholic!! Instead of being made to pray, they now teach them about each different religion and its beliefs. Kids are taught in a sensitive manner that even if they have been told at home that their god is the true one, they should treat other religions with an equal degree of respect. They encourage curiosity about each other. It is all very nice and inclusive. Last month all the kids in p6 in our school went on a school trip called 'Diversity day' - they spent a good number of hours discussing Christianity, Islam, Hinduism, Judaism, Sikhism, Buddhism, and they even went into the Bahá'í faith, but here's what I don't get, they never teach kids about atheism. Not only do they not go into it in detail, they don't even touch on its existence. Looking at recent figures for Scotland, atheists account 52% of the Scottish population, so why does no one ever tell school kids that it's actually ok to be from an atheist family? In the last 5 years I have been to four funerals, three were humanitarian/atheist, one was christian and I am not sure I can even remember the last time I attended a christian wedding in Scotland. Three or four years ago Anna asked me what our family was because they'd been learning about religions in school. She was about 6 years old. I explained that daddy's parents were christian (Protestant) and mummy's were atheist and that our own family unit was also atheist. I explained what that meant and she felt happy that we too had a label just like all the others. She mentioned it to a boy in her class the next time the topic arose. The boy, from a Christian family, looked her straight between the eyes and announced that if she didn't believe in god, she would be sent to hell and burn for all eternity! Delightful child! There is no way that child would have said that to a Hindu or Muslim child because he had been taught to respect them, but apparently it is ok to treat atheist families with contempt as they are brushed under the carpet. Because atheists don't have specific festivals or places of worship, it is somehow felt that they are not worth mentioning, but that does a terrible injustice to those kids. Until we are lined up alongside all the other faiths, schools shouldn't claim to be teaching diversity, but instead religious diversity. 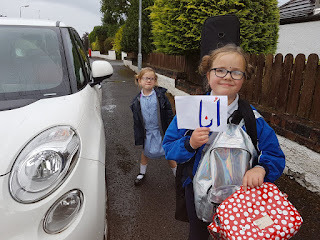 Anna had a really lovely day out with her classmates, came back wearing a bindi and proudly showing me her name in Arabic, but felt a little deflated too because, as she put it herself 'it was as if we didn't exist'.